We convert all sanding belts. We carry Aluminum Oxide, Silicone Carbine, and Zirconia materials. 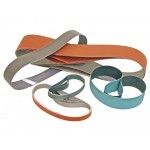 We stock a large assortment of different size sanding belts and we also make to order custom size sanding belts. Give us a call and get quoted on the size you are looking for. We custom make any size belt to fit your need. Features and benefits High resistance to clo..